For other uses, see Ottawa Senators (disambiguation). The Ottawa Senators are a professional ice hockey team based in Ottawa, Ontario, Canada. They are members of the Northeast Division of the Eastern Conference of the National Hockey League (NHL). The Senators play their home games at the 19,153 seat (20,500 capacity) Canadian Tire Centre, which opened in 1996. The team was started by Ottawa real estate developer Bruce Firestone, the team is the second NHL franchise to use the Ottawa Senators name. The original Ottawa Senators, founded in 1883, had a rich history, winning 11 Stanley Cups and playing in the NHL from 1917 until 1934. On December 6, 1990, after a two-year public campaign by Firestone, the NHL awarded a new franchise, which began play in the 1992–93 season. The current team owner is Eugene Melnyk, and in 2011, the club was valued by Forbes Magazine at $201 million. The team has had success, qualifying for the Stanley Cup playoffs in twelve of the past fourteen seasons, four division titles, the Presidents' Trophy in 2003 and appeared in the 2007 Stanley Cup Finals. The success has been reflected in attendance. The club has averaged over 18,000 fans per game since 2005–06, peaking at 19,821 in 2007–08. Statistics are accurate through the firing of Guy Boucher. Bryan Murray was the seventh and longest serving general manager in franchise history. He held the position from 2007 to 2016. Source: Ottawa Senators 2009–10 Media Guide, p. 206. Roger Neilson – Senators' assistant coach and head coach (2001–2003) was inducted (as a Builder) on November 4, 2002, for his career in coaching. Dominik Hasek – Senators' goaltender (2005–2006) was inducted in 2014 for his career as a goalie. 1 Finnigan was honoured for his play from 1923 through 1934 for the original Ottawa Senators (as a right wing, 1923–1931 and 1932–1934). He was the last surviving Senator from the Stanley Cup winners of 1927 and participated in the 'Bring Back the Senators' campaign. 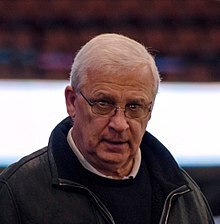 Bryan Murray – Senators' head coach (2005–2008) and general manager (2007–2016). 1 Finnigan was honoured for his play from 1923 through 1934 for the original Ottawa Senators (as a right wing, 1923–31 & 1932–34). He was the last surviving Senator from the Stanley Cup winners of 1927 and participated in the 'Bring Back The Senators' campaign. 2 Gretzky's sweater number was retired league-wide by the NHL. (Source: NHL staff (2001). National Hockey League Official Guide & Record Book 2002). Dan Diamond & Associates. Recording 687 points playing with the Senators, Jason Spezza is the franchise's second highest all-time points leader. 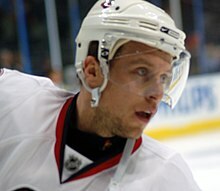 Dany Heatley holds the franchise record for most goals in a season, scoring 50 goals in the 2005–06 and 2006–07 seasons. ↑ "Bulletin: Senators Introduce Updated Primary Logo". OttawaSenators.com. NHL Enterprises, L.P. August 22, 2007. Retrieved February 15, 2017. ↑ "2007-2018 Ottawa Senators–Greatest NHL Uniforms". GreatestNHLUniforms.com. NHL Enterprises, L.P. Archived from the original on May 9, 2018. Retrieved May 8, 2018. ↑ "Jerseys & Logos". OttawaSenators.com. Capital Sports & Entertainment Inc. Archived from the original on September 17, 2018. Retrieved May 8, 2018. ↑ NHL counts 11. Hockey Hall of Fame count is 10. ↑ "#14 Ottawa Senators". Forbes. November 8, 2007. Retrieved January 22, 2008. ↑ "Ottawa Senators on the Forbes NHL Valuation List". Forbes. November 30, 2011. Retrieved November 30, 2011. ↑ "NHL Attendance Report". ESPN. Retrieved March 26, 2010. ↑ "Rick Bowness Coaching Record". Hockey-Reference.com. Retrieved January 31, 2009. ↑ "Dave Allison Coaching Record". Hockey-Reference.com. Retrieved January 31, 2009. ↑ "Jacques Martin Coaching Record". Hockey-Reference.com. Retrieved January 31, 2009. ↑ "Roger Neilson Coaching Record". Hockey-Reference.com. Retrieved January 31, 2009. ↑ "Bryan Murray Coaching Record". Hockey-Reference.com. Retrieved January 31, 2009. ↑ "John Paddock Coaching Record". Hockey-Reference.com. Retrieved January 31, 2009. ↑ "Craig Hartsburg Coaching Record". Hockey-Reference.com. Retrieved January 31, 2009. ↑ "Cory Clouston Coaching Record". Hockey-Reference.com. Retrieved April 20, 2009. ↑ "Paul MacLean Coaching Record". Hockey-Reference.com. Retrieved May 10, 2013. ↑ "Dave Cameron Coaching Record". Hockey-Reference.com. Retrieved April 14, 2016. ↑ "Guy Boucher Coaching Record". Hockey-Reference.com. Retrieved March 7, 2019. ↑ Pritchard, Trevor (December 29, 2016). "Ottawa Senators retire Daniel Alfredsson's No. 11". CBC News. Retrieved December 30, 2016. ↑ Garrison, Bruce (2017-01-24). "Bryan Murray the right selection as the first member of the Senators' Ring of Honour". Ottawa Citizen. Retrieved 2017-09-09. ↑ Ottawa Senators staff (2015). 2015–16 Senators Media Guide (PDF). Ottawa Senators. p. 204. Retrieved December 25, 2015. ↑ "Chris Phillips". hockeydb.com. Retrieved May 3, 2012. ↑ "Prince of Wales Trophy". National Hockey League. Archived from the original on April 23, 2006. Retrieved January 2, 2008. ↑ "Presidents' Trophy". National Hockey League. Archived from the original on October 13, 2009. Retrieved January 2, 2008. ↑ "Calder Memorial Trophy". National Hockey League. Archived from the original on April 23, 2006. Retrieved January 2, 2008. ↑ "NHL Plus Minus Award Winners". statshockey.homestead.com. Archived from the original on September 16, 2007. Retrieved January 2, 2008. ↑ "Jack Adams Award". National Hockey League. Archived from the original on July 6, 2008. Retrieved January 2, 2008. ↑ "Norris Memorial Trophy". National Hockey League. Archived from the original on May 11, 2008. Retrieved June 21, 2012. ↑ "King Clancy Memorial Trophy". National Hockey League. Archived from the original on July 23, 2008. Retrieved June 21, 2012. ↑ "Mark Messier Leadership Award". National Hockey League. Retrieved August 26, 2018. ↑ 34.0 34.1 "Notes for Daniel Alfredsson". National Hockey League. Retrieved January 2, 2008. ↑ "Career Stats for Sami Salo". National Hockey League. Retrieved January 2, 2008. ↑ "Career Stats for Marian Hossa". National Hockey League. Retrieved January 2, 2008. ↑ "Career Stats for Martin Havlat". National Hockey League. Retrieved January 2, 2008. ↑ "Career Stats for Andrej Meszaros". National Hockey League. Retrieved January 2, 2008. ↑ 39.0 39.1 "Career Stats for Dany Heatley". National Hockey League. Retrieved January 2, 2008. ↑ National Hockey League. "NHL announces 2011–12 All-Star teams". Press release. http://www.nhl.com/ice/news.htm?id=635356. Retrieved June 23, 2012. ↑ "Career Stats for Alexei Yashin". National Hockey League. Retrieved January 2, 2008. ↑ Ottawa Senators staff (2015). 2015–16 Senators Media Guide (PDF). Ottawa Senators. pp. 191–7. Retrieved December 25, 2015. ↑ NHL Media Guide 2010. The original Senators organization, also known as the Ottawa Hockey Club, won the Stanley Cup eleven times, not the current franchise founded in 1992. Neither the NHL or the Senators claim the current Senators to be a continuation of the original organization or franchise. The awards, statistics and championships of both eras are kept separate and the NHL franchise founding date of the current Senators is in 1992. This page was last changed on 25 April 2019, at 12:37.